RVSM compliant microprocessor-driven pressure calibrator designed to provide regulated static (Ps) and total (Pt) pressure/vacuum outputs to simulate altitudes and airspeeds (Qc) in avionic instruments. A 480-character touch panel display prompts the operator through the test and calibration process. RVSM compliant pressure calibrator regulates pressure/vacuum from 0.3 to 32 in-Hg for Ps and 0.5 to 110 in-Hg for Pt. Accurate: ±0.002 in-Hg for Ps and ±0.004 in-Hg for Pt. Altitude readings displayed using feet or meters units. Airspeed readings displayed using Knots, km-hr, or Mach units. Pressure/vacuum readings displayed using in-Hg, psi, mm-Hg (Torr), in-H2O, or millibar units. Air data control, air data monitor, Ps control, Pt control, gauge test, leak test, and TTU-205 test modes available. Interactive touch panel display prompts the user through the test process and setup procedures: Reduces the likelihood of operator error. IEEE-488/GPIB interface enables remote control of the unit from a PC compatible computer. 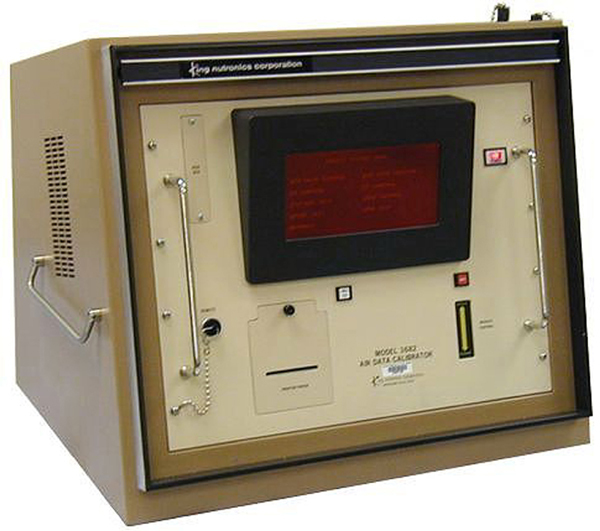 Handheld remote control module with 10-foot cable (included) duplicates front panel displays and controls for convenient observation of instruments being tested. Built-in printer generates permanent records of measurement data. Console-type enclosure incorporates a hinged and removable top/rear panel for easy access to system components. Airspeed: Knots, Km/Hr, Mach No. Send questions or comments regarding this website to webmaster@kingnutronics.com Copyright © 2014 by King Nutronics Corporation. All rights reserved. Last update on June 23, 2017.